Industry body CII today said it has signed an initial agreement with the World Economic Forum to collaborate for partnerships in various spheres including infrastructure investments and human capital. Amid a weak stock market, top-nine sensex companies saw a cumulative loss of Rs 58,987 crore in market capitalisation (m-cap) last week, with energy majors — RIL and ONGC — taking the steepest hit among the blue-chips. As RBI gears up to issue new bank licences, capital markets regulator Sebi has also a job at hand that is of scrutinising all applicants coming under its jurisdiction directly or through group entities. Kingfisher posted a net loss of Rs 715 crore for quarter ended September 30, 2013, while its accumulated losses at the end of last fiscal stood at over Rs 16,000 crore. The Export-Import Bank of India has identified 15 African countries, including Egypt, Kenya, South Africa and Nigeria, as good investment destinations, a top official has said. Apex industry body, PHD Chamber of Commerce and Industry’s geographical span covers 12 states including the northern states of Punjab, Haryana, Delhi, Uttarakhand, Himachal Pradesh, Jammu & Kashmir, Chandigarh, Rajasthan among others. In an interview, Suman Jyoti Khaitan, President, PHD Chamber tells Sanjeev Sharma that the recent high-profile corporate allegations can have an impact on revival of business confidence and investor sentiment. Private sector lender Dhanlaxmi Bank will raise Rs 130 crore this quarter as part of its efforts to intensify business growth, a senior official said. The bank, which had a target to mop up Rs 300 crore as Tier-I capital, has already raised Rs 170 crore during the first quarter of the current fiscal. Macroeconomic data, movement of the rupee against the US dollar, foreign investments trend and earnings from blue-chips such as SBI would drive the stock markets in a holiday-shortened week ahead, experts said. Most people wish to own their dream home. They work hard, save/invest money and borrow, to fulfil this aspiration. However, not many think of a situation in which the precious home needs to be protected, especially in their absence. Listed below are a few ways in which you can safeguard your home, even when you are not there. Are Senior Citizen Plans Helpful to People Over 70 Years? Health insurance is not a luxury; it is a complete necessity. As a result, every citizen needs to be insured. But as we all know, insurance companies like selling their policies to people who are young and healthy. As a result, most health insurance policies cater to the young population with just a handful of health plans available for senior citizens. Continuing their selling spree in the stock market, domestic mutual funds have offloaded shares worth more than Rs 4,000 crore in October amid profit booking. "CII and World Economic Forum today signed an MoU to collaborate in delivering a strong engagement across all multi stakeholder groups in India," the industry body said in a statement. 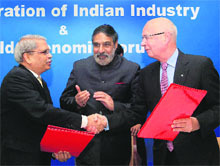 The MoU was signed by Klaus Schwab, Founder and Executive Chairman, WEF and Kris Gopalakrishnan, President, CII in the presence of Commerce and Industry Minister Anand Sharma. "The reform process in India is in full swing and the government has taken several measures which are yielding positive results specially in the areas of recovery of rupee and stock market," Sharma said. He invited WEF to organise an integrated South Asia Economic Summit in Delhi, the same way as WEF organises the India Economic Summit. Over the past week, the stock market benchmark sensex lost 530.66 points or 2.5% to 20,666.15. Sebi's scrutiny follows detailed queries shot off by RBI to various regulators in India and abroad as part of its due diligence of entities seeking to enter banking arena. According to a senior official, Sebi is looking into the capital market track-record of all the group entities of 26 banking aspirants, some of whom are either listed entities or have presence in Sebi-regulated businesses like mutual funds, brokerage and investment banks. The area of prime focus for the Securities and Exchange Board of India (Sebi) is action taken by or underway for violations to various market regulations, he added. The scrutiny is expected to be over this month itself. RBI is granting new bank licences for the first time in about a decade and preliminary screening process is underway for 26 entities that have submitted their applications. As part of this process, RBI has also asked the applicants to provide further details about their promoters, equity structure, financial inclusion programme, proposed banking model, among others, sources said. In addition to Sebi, RBI is also seeking details from other regulators such as insurance watchdog IRDA and pension regulator PFRDA, about the businesses of the applicant entities under their respective jurisdictions. With regard to some applicants, RBI has sought to know details about source of funds and compliance to the structural norms proposed for new banking players. Besides, RBI is seeking additional details from the concerned foreign regulators about those applicants whose group entities have operations, significant business dealings with foreign companies or overseas listings. Sources said this due diligence process involves information exchange with domestic and foreign regulatory authorities for all group entities of the applicants. RBI has also set up an expert panel to look into the applications. Headed by former RBI Governor Bimal Jalan, this committee includes RBI's former Deputy Governor Usha Thorat, Sebi's former Chairman C B Bhave and financial sector expert Nachiket Mo. This panel held its first meeting on November 1. RBI's board will take a final decision on new licences after taking into account the panel recommendations. The names of successful entities are expected by January 2014. The applicants include entities from large corporate houses like Tatas, Anil Ambani-led Reliance Group, Kumar Mangalam Birla-headed Aditya Birla Group, L&T, Bajaj, SREI, Religare and Indiabulls. Besides, Department of Post, IFCI, LIC Housing Finance, JM Financial, Muthoot Finance, Edelweiss, IDFC, India Infoline and Shriram Capital are also in the fray. In their latest quarter review report, Jet Airways' auditors have also said that "the appropriateness of assumption of going concern is dependent upon implementation of the alliance with Strategic Partner (Etihad Airways) and/or the company's ability to raise requisite finance/generate cash flows in future to meet its obligations, including financial support to its subsidiary." Earlier this year, Jet proposed to sell 24 per cent stake to Abu Dhabi-based Etihad, but the deal has been stuck for a long time for want of various regulatory approvals. Posting a net loss of Rs 891 crore for July-September 2013 quarter, Jet said that Etihad deal is expected to result in "sustainable cash flows and accordingly the statement of financial results continue to be presented on a going concern basis, which contemplates realisation of assets and settlement of liabilities in the normal course of business." Spicejet's auditors, in their limited review report for the July-September quarter, said that the company's operating results have been materially impacted by various factors and its accumulated losses as on September 30, 2013, have fully eroded the networth of the company. "The appropriateness of the going concern assumption is dependent on the company's ability to establish consistent profitable operations and generate positive cash flows as well as raising adequate finance to meet short-term and long-term obligations," the auditors said, while adding that that the management believes that the going concern assumption is appropriate. Reporting a net loss of Rs 559 crore for the quarter, Spicejet said its operating results continued to be materially affected by factors like high fuel costs, currency depreciation, seasonal pricing pressure and economic slowdown. However, various measures being undertaken by the company and improving investor sentiments "will not only result in sustainable cash flows, but also enhance the company's plans for expansion," Spicejet said. Industry has expressed apprehensions about high profile corporate investigations dampening investor sentiment. What are your views? PHD Chamber apprehends that the high-profile corporate allegations can have an impact on revival of business confidence and investment sentiments amongst the business community. How do you assess the economic slowdown and weakening of the investment cycle? The sign of investment revival are re-emerging once again as there has been an uptick in new investment announcements of 4 per cent from Rs 846 billion worth of fresh investments announced in the first quarter of financial year 2014 to Rs 881 billion during the second quarter. Also 280 projects were announced during the second quarter with cement and steel sector witnessing an increase of 50 per cent and 40 per cent respectively in fresh investment announcements. Recent reforms undertaken by the central government in terms of fast track project approvals and enactment of the Land Acquisition Bill will help in reviving the investment cycle in the coming quarters. However, in an increasingly global environment, structural constraints, such as inadequate infrastructure, high borrowing costs and rigidity in labour markets inhibit the pace of industrial restructuring would hamper production growth and investment environment. What are your views on Raghuram Rajan committee on backwardness criteria for states with specific impact on the northern states? The Report on Composite Development Index of States by Dr Raghuram Rajan committee highlights most of the states under the command area of PHD Chamber falls under the category of least developed, which includes Bihar, Madhya Pradesh, Chhattisgarh, Jharkhand, Uttar Pradesh, Rajasthan which is disappointing. Jammu & Kashmir and Himachal Pradesh fall under the category of less developed. However, it is encouraging that Haryana, Uttarakhand and Punjab are relatively developed. What is the investment outlook for the northern region? The investment outlook in the Northern region is very encouraging and optimistic. However, considering the inadequate, relatively inefficient and high cost infrastructure, high costs of borrowed funds, inflexibilities in labour markets and other institutional rigidities, is significantly holding an impact on the investment scenario of the region. There exists a greater potential for the region to grow in higher trajectory. What are the main problem areas for industry in the region? Northern region is currently encountering a huge infrastructure deficit which is by far one of the most binding constraints to accelerating growth. The states in this region are not connected with the major ports of the country which impact the exports and imports of the states. The development of DMIC would pay a healthier path for the industrial production, employment generation, boosting exports and the revival of overall investment milieu. What can be done to boost investments in the region and revive investor interest which is not very high compared to the other regions? PHD Chamber feels that in order to boost investments in this region, it is necessary to remove an array of unnecessary, burdensome, expensive and at times even counterproductive regulations, meeting the alarming infrastructure gap, technology advancement, focusing on R&D of the manufacturing units, credit availability, establishing sector specific economic zones, and increasing the pace of the Amritsar-Delhi-Kolkata industrial link. Further, labour laws in our country definitely need to be revisited, especially in light of the evolutionary changes in the industry, its types, processes and problems. "The bank has raised Rs 170 crore in the first quarter of this fiscal and will raise another Rs 130 crore in the current quarter. Capital raised will be utilised to intensify business growth and further strengthen the Capital Adequacy Ratio," Dhanlaxmi Bank Ltd Deputy General Manager L Chandran said. The Bank's Capital Adequacy Ratio (CAR) stood at 11.85 per cent for the quarter ended September 30, 2013, as against 11.73 per cent registered during the first quarter of this fiscal. Dhanlaxmi Bank registered a net loss of Rs 1.85 crore for the second quarter, as compared to a net loss of Rs 18.62 crore registered during the same period last year. For the half-year ending September 30, the net profit of the bank stood at Rs 1.73 crore from a net loss of Rs 30.43 crore registered during the corresponding period of previous year. For the year ending March 31, 2013, the net profits of the bank stood at Rs 2.62 crore. The deposits of the bank grew to Rs 11,906 crore for the quarter ending September 30, 2013, as against Rs 11,206 crore registered during the first quarter of the current fiscal. The net interest income of the bank rose to Rs 82.43 crore for the second quarter, as against Rs 63.48 crore registered during the first quarter of the current fiscal. The Bank's yield on advances improved by 12.82 per cent for the quarter from 12.11 per cent registered during the same period a year ago. Industrial production data for September would be announced on Tuesday. A home loan is availed for buying a house. However, you will never want your family to get burdened with your outstanding home loan. 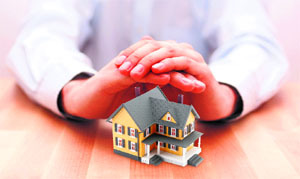 In case of an unfortunate event, your family will have to repay the home loan and pay EMIs. If they are unable to repay, the bank has the right to take possession of your house. So, it is advisable to buy a term insurance cover, equal to the home loan amount. Term insurance will pay the sum assured to the nominee, in case of your death and the loan can be repaid from the insurance proceeds. Additionally, you should also buy a critical illness cover as well as an accidental disability insurance cover equal to the home loan amount, as your term insurance will not pay you, in case of any disability - it will pay only in case of death. Your income will stop in case of an accidental disability or serious disability like a kidney failure, paralytic stroke, etc. Despite this, you will have to pay the EMIs. If you are adequately covered, the insurance company pays the sum assured or weekly benefit, in case of critical illness/accidental disability, which serves as an income replacement, so you can continue paying the EMIs. You buy your dream house, furnish it and install the latest electronic equipment in it. However, do you ever think of what will happen if your house catches fire or there is a burglary? To cover these risks, you need to get home insurance. Home insurance covers loss or damage to the house and its contents in case of events such as fire, earthquake, lightning, floods, etc. It also covers the contents of house, including domestic appliances and electronic equipment in case of theft or burglary. You buy your dream house so that your family and you can live happily. The biggest problem arises in case of your untimely death. Your predecessors, siblings and children, may get into misunderstandings and fights for the assets, especially your house. It is advisable to write a will, so that your assets are inherited by the people you want them to go to. With a will in place, the ownership of your house is passed on to the person you wish to bequeath it to, in the event of your death. It is better to be safe than sorry, so these are the certain things you should do so that your house is secure in your absence. By doing this, you can be rest assured that your house is secure and your family doesn't have to face any problems. It's time to open your files, check whether you are insured adequately (if you have a home loan), buy a home insurance and write a will. Health insurance is not a luxury; it is a complete necessity. As a result, every citizen needs to be insured. But as we all know, insurance companies like selling their policies to people who are young and healthy. As a result, most health insurance policies cater to the young population with just a handful of health plans available for senior citizens. These plans however are very effective and with the help of some additional riders, you can get a comprehensive coverage. Previously most insurance companies limited the entry age to 60 or 65 years, but now we have policies that admit people till the age of 80, which is very promising indeed. These policies have provisions for pre-existing illnesses as well. Take a look at the best health plans for seniors above the age of 70. Pitted as one of the best health plans for senior citizens, the Varistha Mediclaim by National Insurance offers some great benefits to people above the age of 70 years. Take a look. * Any person up to the age of 80 can enter the plan and it can be renewed till the policyholder is 90 years old. * Sum assured of Rs.1 lac available for hospitalization charges and Rs.2 lac for critical illnesses. For a person above the age of 70 (71-75), the premium for the former is Rs.5568 and for the latter is Rs.2200. * Critical illnesses include coronary artery surgery, cancer, renal failure, stroke, multiple sclerosis, major organ transplants (kidney, lung, pancreas, bone marrow). Paralysis and blindness also covered at an extra charge. 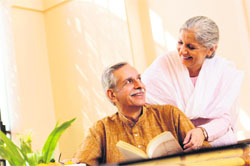 Another very useful plan, the Mediclaim for Senior Citizens by New India Assurance is becoming very popular. Some of the features of this plan are listed below. * Maximum entry age is 80 years. * Pre-existing diseases are covered only after 18 months. * If spouse is also covered, a discount of 10% is available. * Minimum cover of Rs.1lac and maximum cover of Rs.1.5lac available. * Limited cover also available for alternative treatments like Ayurveda and Unani. This plan has the highest sum assured (Rs.5lac). The plan is available to people till the age of 75 and with many benefits, it is a very popular plan. * Maximum entry age is 75, with no age limit on renewals. * A cover of Rs.1lac will cost Rs.5000 annually and of Rs. 5lac will cost Rs.20,225. * Pre-existing illnesses covered from the 1st year itself. * Daily ICU expenses provided, not exceeding 2% of the sum assured. * No medical tests required, but a discount of 10% can be availed if healthy reports of blood, urine, etc are submitted. Apart from the above mentioned policies, the Specified Disease Plan from United India Insurance and the Senior Citizen Specified Disease Plan from Oriental Insurance are also good health plans for senior citizens. It is always beneficial to opt for these plans as they provide a healthy cover. The amount may not always be enough, but they do provide a substantial protection. The premium amounts are not very unreasonable and most policies, specially the Varistha Mediclaim from National Insurance, have healthy provisions for pre-existing illnesses as well. So overall, it can be said that the senior citizen plans are indeed helpful for people over 71 years of age. The funds sold shares worth a net Rs 4,018 crore in the equity market during October, while they had pulled out a net Rs 2,800 crore in the preceding month, according to latest data available with market regulator Sebi. 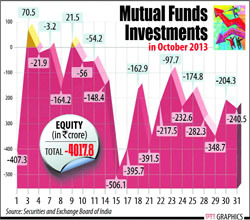 However, equity MFs were net buyers in the equity market in August and bought stocks worth Rs 1,600 crore. With the latest outflow, mutual funds net withdrawal from stock market reached to more than Rs 9,200 crore since the beginning of the year (January-October). In comparison, foreign institutional investors made a net inflow of more than Rs 15,000 crore during October. "The equity category had seen some kind of inflows in August on the back of value buying, although the inflow amount was too small," Axis MF MD and CEO Chandresh Nigam said.